Irtiqa: Mystery solved? The dino sequence in "The Tree of Life"
Mystery solved? The dino sequence in "The Tree of Life"
Since, as he acknowledged, the CGI dinosaurs are painstakingly created from 0s and 1s and therefore has to be meticulously planned in every detail, what was the intent of the pivotal scene in which the one dinosaur stomped on, and then seemed to caress/stroke, a smaller dino who was lying in a riverbed? Turns out, Michael was in charge of that very sequence, and discussed it thoroughly, on many occasions, with Malick himself. The premise of the four-shot scene was to depict the birth of consciousness (what some have called the "birth of compassion") -- the first moment in which a living creature made a conscious decision to choose what Michael described as "right from wrong, good from evil." Or, perhaps, a form of altruism over predatory instinct. Reptiles emerge from the amphibians, and dinosaurs in turn from the reptiles. Among the dinosaurs we discover the first signs of maternal love, as the creatures learn to care for each other. Is not love, too, a work of the creation? What should we have been without it? How had things been then? Silent as a shadow, consciousness has slipped into the world. Leaving aside the question of whether the science behind this depiction of dinosaur life is sound (or, at least, generally accepted), that is the intention of the scene. Hmm...okay. This is an interesting way think about consciousness (if you are interested in exploring this messiness around this questions, here is the entry on Consciousness in the Stanford Encyclopedia of Philosophy). 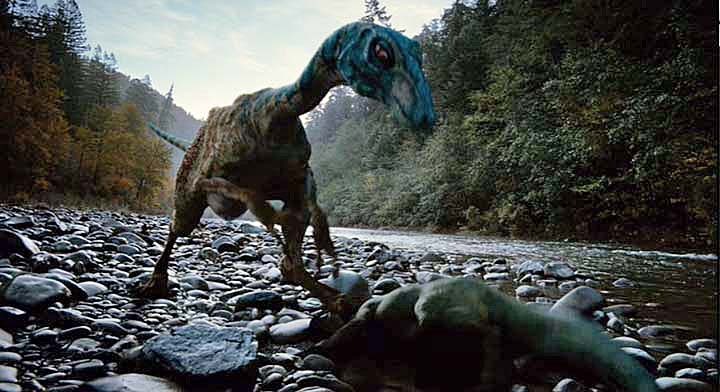 This particular scene in the film doesn't negate altruistic behavior amongst animals that "succeeded"dinosaurs, all the way from bats to primates, even if the process can be explained from naturalistic evolution. And the scene continues one of the central themes of the film: How (both as a direct question and as in the sense of methodology) do we make sense of the universe that we find ourselves in? As I have said before, this movie may not be everyone's cup of tea. But if you like ambitious, challenging films, on the scope of 2001: A Space Odyssey, then definitely give it a shot. By the way, Roger Ebert recently included The Tree of Life as one of the 10 greatest films of all time. For Goodness sake! Since we've GOT to have empathic dinosaurs in the movie, why not just go the whole Rex and admit that it was what it was. The dinosaur holds the ailing dinosaur's head down so that it does not get spotted by the rest of the pack. It's compassion. Pity. Reptilian kindness - whatever that is. "Keep your head down or they'll see you!" Durr.